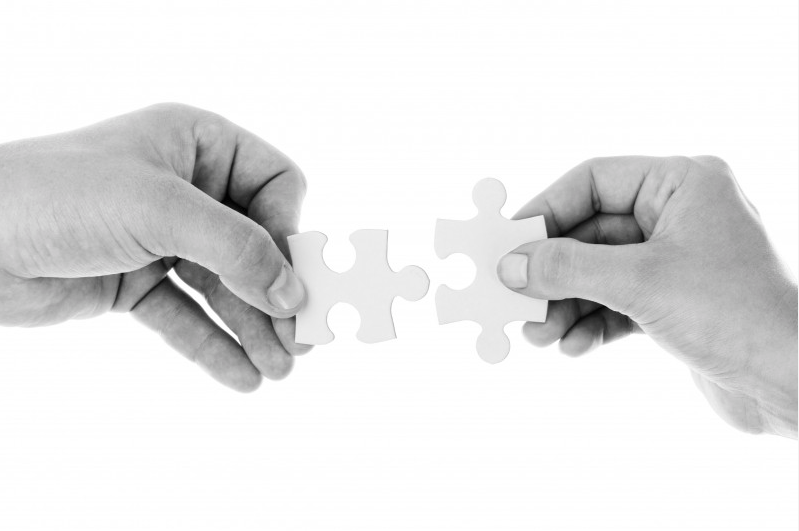 When people think of public relations, they think of hiring someone to help them get on TV, write blog posts, or plan an event. Yes, all of that is great, but do you know what’s even better? Customer service. Think about the way you react when you experience great customer service. You tell everyone about it, right? Word of mouth and referrals are what grow businesses. This is why it’s so important to treat every, single customer like he or she could make or break your business… because I believe one customer has the power to do that. [Tweet theme=”tweet-box-shadow”]Treat every, single #customer like he or she could make or break your #business. [/Tweet] Take a look at this example. A small fish and chips restaurant made international headlines without paying a dime. Instead, the owner of the restaurant gave one customer above and beyond customer service. 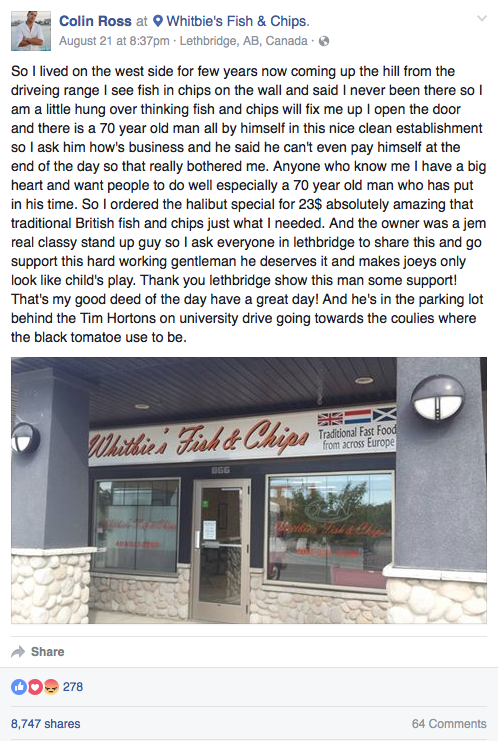 In return, he posted one thing to his Facebook page, and now we all know about Whitbie’s Fish and Chips in Canada. Not to mention, within two days of this post, the owner of Whitbie’s saw about 1,000 customers. While I love seeing stories like this one, you usually see more of the negative ones. Thanks to social media today, it’s so easy to hop online and complain about anything and everything. Sometimes a business will reply and try to make things right. Other times, it won’t. Let me give you a personal example of bad customer service… and the inspiration for this post. After I bought a laptop from Costco, it started running slowly – so slow, I stopped using it for months. Then, I remembered I was under a warranty with Costco, so I should try to get it taken care of. (Duh!) In the span of one month, I spent hours talking to people in Fort Myers who work with Costco Concierge Services in tech support. When I say hours, I mean I spoke with about 60 different people – Aaron, Justin, Mary, Aleah, Bret, Anthony… you get my drift. While they were all very nice (well, all of the except Bret), they couldn’t help me. In fact, they made my problem even worse. I wanted a faster laptop. Instead, videos I created for clients were deleted. Still, I was denied a return. Then, tech support wanted to keep “troubleshooting.” Well, that troubleshooting led to me losing even more – my video editing software (which costs twice as much as the laptop) and Microsoft Office… which was supposed to come installed on the laptop. Yes, I lost that too! You’d think after all of this, costing me time and money, they would apologize and let me return the laptop. A $500 HP Pavilion… to a huge company… like Costco. Guess what? They want to keep “troubleshooting.” (They like that word at Costco Concierge Services.) As you can imagine, after dozens of hours and thousands of dollars lost, I just didn’t have it in me. Now, because of my experience with Costco, the concierge service, tech support, and the people in service dispatch, I will not refer people to Costco. Costco doesn’t care one bit. Why would they? I’m one of 85 million members. That’s a pretty small fish in a gigantic ocean. The company does about 100 billion dollars in sales every year. Do you think they care about me losing something that pays my bills? No way… but with that kind of income, you kind wonder why they wouldn’t just let a woman in PR, with a big mouth, return her $500 laptop?! Hence, why you should treat every customer like they have a big mouth. Not to get too far into another bad customer service story, but LG refused to help me with a mold problem in my front load washer. The company insisted on blaming me taking poor care of it and using too much detergent, despite numerous class action lawsuits against makers of front load washers for this exact problem. But, as soon as a representative was contacted by one of my colleagues in the media to produce a follow-up story to a previous investigation, my washer was fixed in days. So, the result of bad customer service cannot only end with the loss of a customer, but with many people knowing the details of why that customer is a former customer. If you are a small business owner, or you work with small business owners, practice good customer service. I’m not saying the customer is always right. I know there are some real pains in the you know what trying to wheel and deal business owners. I know no matter what you do, you can’t make everyone happy. But, at the end of the day, people do business with people they know, like, and trust. Think of the people you serve first and the money you make second. If you do this, you’ll probably end up making more money. Oh yeah, and I should’ve bought a Mac.